We poke fun of the TSA for being dumb but sometimes we forget that normal people do even dumber things. Like pack a grenade launcher in their carry on. Or try to bring a cannonball on board. 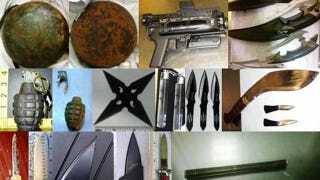 Here's a list of the crazy things the TSA found just last week. In the picture above, from left to right, two cannonballs, a grenade launcher, 'fantasy' knives, grenades, ninja star, nunchucks, throwing knives, a Kukri knife and a whole bunch of other sharp objects. Just a week in the life of a TSA agent, I guess. Honestly, this list is almost as impressive as all of 2011. I mean, a cannonball? These weapons were found in various airports across the country which means there are dumb people everywhere. However, my favorite response to why a passenger tried to bring a kitchen knife on board with them has to go to this guy, who simply responded that there were "no good knives in Cancun." Oh, people. Of course there's more than just crazy items found, the TSA pried out 23 guns through airport security last week with 14 of them being loaded. People, you can't freaking carry a loaded gun onto an airplane. That just isn't happening!